Home / chris adler / john campbell / lamb of god / mark morton / northamerica / randy blythe / willie adler / LAMB OF GOD reveals music vid for their latest single "Embers"
LAMB OF GOD reveals music vid for their latest single "Embers"
Last summer, internationally-renowned heavy rock band LAMB OF GOD released theirlatest Grammy-nominated full-length album, VII: Sturm Und Drang, which includes the emotive anthem "Embers" featuring Deftones vocalist Chino Moreno. 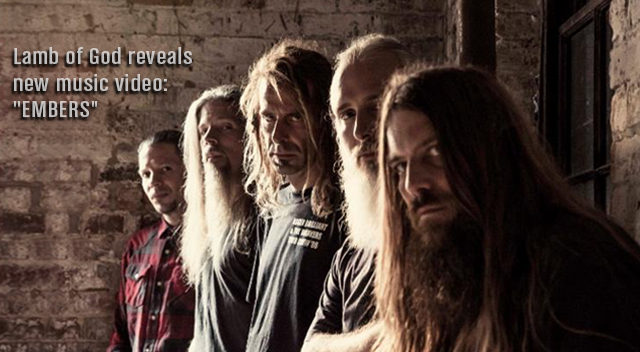 In order to further illustrate the story behind "Embers", LAMB OF GOD has revealed the official music video for the track. The video is directed by Zev Deans, also recognized for directing videos for Ghost, Behemoth, Chelsea Wolfe, and others. LAMB OF GOD will perform in their hometown on August 20th at Gwar BQ 2016 in Richmond, VA. Tickets are available here.